Due to the sheer flexibility PHP provides to its users, it has been used by almost 82% of websites. It’s a great ratio which is increasing at a rapid state and expected to cover a huge landscape in the web development market. Websites based on PHP must be using PHP5 and that’s perfectly fine. But, if you want exceptional features and modernity in your existing website, you need to upgrade yourself in some aspects. Here, the best and the quickstep you can take is to update the website with new PHP7. There’s nothing wrong with PHP5. The only aspect developers and users noticed is the speed and performance of the website. As per the survey, most of the site abandons occur because they take more than 3 seconds to load. Users take website loading too seriously as they want everything instant and on their fingertips. To get over it, you should upgrade to PHP7. Yes! PHP7 has been running tremendously by offering a bag full of amazing features. 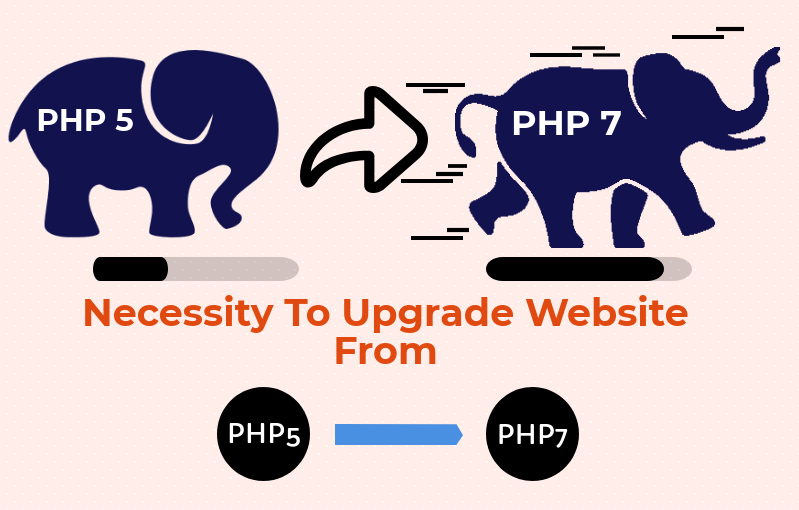 Upgrading to PHP7 not only ensures fast website loading but also far efficient scripting that runs flawlessly every time users access the website. Therefore, if businesses choose to upgrade their websites from PHP5 to PHP7, it would be beneficial for their businesses to grow. Like other updated versions, it has also been launched with so many modern features and capability options. But, critics still raise issues regarding the backward compatibility of PHP7. Whereas a majority of developers is happy to get myriad of benefits of this upgraded PHP version. We are inevitably in support of this new PHP7 version update as it has been rigorously tested before launch and introduced with real speed & site improvement features. The new PHP version is fast as compared to the previous ones and has the potential to compete in this modern world with growing customer demands. To get the best out of PHP7, it would be great if developers get aware of all the changes, updates and advanced features of it. The point to be noted that after PHP5, the next new version should be PHP6 but, it is PHP7. It’s a big jump which brought drastic changes and extended functional capabilities with it. With the introduction of PHP7, developers have witnessed a great shift in the performance of websites and applications. They added, working with the new version provides the liberty to enable hosts which makes the entire PHP scripting run smoothly. Hosts enabling not only ends up making performance seamless but also it hosts a number of customers at the same time using a single hardware. Even PHP7 is running flawlessly for Facebook HHVM which generally operates on JIT (Just In Time) compiler and complies code to the right direction. Here, you can clearly understand that the function “foo” is returning an array as an output. This functionality is not available in previous PHP versions which means that most of the technical readers may not understand what output the function is supposed to provide after final code execution. With PHP7 developers can explicitly declare the return types which give the code a quickly understandable format. Spaceship Operators (< = >) also pronounced as Combined Comparison Operators are used to compare two expressions in a well-aligned code. This is extremely new and the best function developers can reap advantages from. PHP users are now free to use this operator to complement the code and make it more perfect to understand. Elaborating the syntax states – the operator returns -1 if the left operand is less than the right one. It denotes 0 if the value of both the operands are equal and 1 if the left operand contains larger value than the right one. This is a simple function which can be seamlessly used to clearly denote integers, floats and arrays. With previous PHP5 versions, it was daunting to simultaneously run different activities. PHP7 has completely resolved this problem as this allows seamless execution of a variety of tasks. One can do access to the database, networking, set timers and also perform several I/O operations at the same time and without any interruption. As the new version supports multi-threading operational environment which ultimately makes it suitable to handle simultaneous requests from the server. Today, businesses want to have a high customer retention rate which is possible if owners promise a great value proposition to normal and mobile users. Using PHP7 will greatly work here as it offers the feature of reduced memory usage native local threat storage and execution engine improvements. These features are specifically injected in PHP7 to facilitate mobile access. PHP7 is an excellent choice for businesses in terms of improved functionality and exceptional website performance. For e-commerce website owners who are struggling to manage giant traffic on their websites, PHP7 works like a pro and helps them maintain their day to day activities properly. The biggest stress of eCommerce store owners is to make sure that all the associated internal APIs are running properly and are ready to tackle a huge panel of requests without depleting much power. PHP7 has professionally overcome this big hassle by also allowing to reduce their operational expenses. There are many other technical aspects that have also contributed a lot in making PHP7 an ideal choice for today’s modern business. Let’s have a look at some of the syntax updates came with PHP7. In PHP7, traditional error handling criteria has been prolifically replaced with object-oriented exceptions. Through this feature, developers have been finding and fixing bugs in the existing code. The syntax for variable dereferencing has changed in this version which makes the code more consistent. In previous PHP5 version, if a bug is found, it allows the switch statement to display multiple default clauses. This ultimately leads the code running in an uncertain direction. Upgrading to PHP7 will not let encounter this issue. Earlier in PHP5, there was a fashion of marking comments with “#” symbol in INI files. Now, developers are allowed to define the comments by simply prefixing the semi-colon. The advantages we have accumulated are proven and have been reaped by many businesses that have already upgraded from PHP5 to PHP7. It’s quite risky to upgrade to PHP7 as it includes so many obligations and standards that need to be followed carefully by a technical person. But, when you switch to this new scripting version even after all these intricacies, you will experience an extremely new phase of your existing website. We at Sparx IT Solutions, the trusted PHP development company accomplish your desired needs with professionalism.